You shouldn't be stuck for something to do in Belfast this weekend. Open House Festival still has a couple of days of gigs to attend as they fuse American roots and Irish traditional music together in the Cathedral Quarter. And ChilliFest is back in Custom House Square, with Nacho stands, a Cajun Cafe and a BBQ Pit as well as chilli pepper eating competitions, Strictly Come Barn Dancing ... and music from Urban Voodoo Machine (Sat afternoon) and Alabama 3 (Sun afternoon). Great Belfast Art Hunt is back, meeting in front of Belfast City Hall on Saturday at 1pm for a afternoon of solving clues as you dander between galleries across the city to try to win the great prizes. Concludes with a party in a gallery at 4pm. £6 (£5 concession). Not to mention this weekend's Belfast Titanic Maritime Festival down beside (and behind) the Odyssey in Queen's Quay and Abercorn Basin. Tall ships, stalls, children's activities and street theatre. Step on board the Bounty and relive all those awful moments from Pirates from the Caribbean (as well as many, many better films). And if you prefer gaming and anime to boats and bands, head up to QUB Students' Union which is the venue for this year's Q-Con. Consoles, LAN gaming, role playing, war gaming, board games, screenings, charity events as well as traders and ... bands. No escaping music this weekend in Belfast! Pick’n’Mix Festival is showcasing a great variety of staged readings, mini plays and dance performances this weekend in Queen’s University’s Brian Friel Theatre and rehearsal studio. The box office is closed, the performances have started, but there should still be some tickets on sale from the venue. It’s not too late to catch the farcical Cooking with Elvis (Bruiser); children shows (Cahoots); up to the minute satire (Tinderbox); Songe for Jean McConville - Requiem for the Disappeared (opera by Ransom); kinetic motion sensors supporting a three dimensional dance performance in a virtual world (Eileen McClory); and lots lots more. Tickets £5 with some double dip offers (two shows for the price of one). More details on The MAC website or on Facebook. And don’t forget that the Belfast Book Festival still has a few more days to run around the corner in the Crescent Arts Centre. Malachi O'Doherty - a science fiction fan - explored the role of faith and religion in science fiction in a package on this morning's Sunday Sequence. Broadcast a week late for the mid-season finale of Doctor Who .... but never mind! There's nothing dates like the future. The visions of the future that we had fifty years ago are horrendously out of date now. They're nothing like what we have now. In fifty years time our visions of the future will be different again and sci fi will be adapting to that. Food for thought as I write up my vision of a utopian Northern Ireland! More about that in a month or two. It'll not be long before the smaller ball will be hoisted up and dropped into the middle of the larger, outer ball. 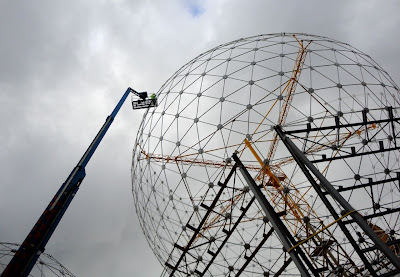 The scale of Wolfgang Buttress' sculpture is finally clear, and within a few weeks the Balls on the Falls RISE will be finished and drivers will no longer be so distracted with the mechanics of its construction, making Broadway Roundabout a safer place to drive around. Moderators of the Presbyterian Church in Ireland take on the role of the denomination’s ambassador for twelve months. By the end of their term, most moderators appear to have grown in wisdom and understanding of both the church and society, as well as become quite weary with the workload and travel. I spoke to both the outgoing moderator Dr Norman Hamilton and moderator designate Dr Ivan Patterson on Friday afternoon, asking them about their experiences and anticipations of the role. Prior to taking a year out to be moderator, Norman Hamilton had been ministering in Ballysillan Presbyterian Church and the surrounding north Belfast for more than twenty years. He described his feelings in the run up to becoming moderator last June as “a mixture of apprehension and excitement and anticipation and certainly a journey into the unknown both in terms of places to go, people to meet and situations to encounter”. During their year, PCI’s moderator has duties within the denomination. Outside of ecclesiastical circles there is a role in wider society too. In Norman’s case, that included seven engagements with the Royal Family and three with President McAleese. Norman reflected that it is time “to redefine the relationship of the church with the state”. That includes rethinking role of the ‘four main church leaders’. I wondered whether it was time for a fifth person to stand alongside them to give a non-religious viewpoint. “I am very uncertain about the value of statements from the four church leaders to be honest. Some of the latest initiatives by the Taoiseach out of the Lisbon Treaty do involve other faiths and indeed do involve humanists. And I was at the first meeting of that group convened by the Taoiseach only a couple of weeks ago. The Presbyterian Church in Ireland’s motto is Ardens sed Virens – “burning but alive” or “burning but flourishing”. Is the denomination flourishing? Both in his work in North Belfast and over the last year as moderator, Norman Hamilton has conversed with many politicians. What is his assessment of the maturity of our local political process? Cohesion, sharing and integration was a theme throughout Norman Hamilton’s year. He even appeared at the SDLP’s conference as part of their Shared Society panel debate. Has he seen any tangible progress? “There hasn’t been a lot of tangible progress in policy terms in the north. The widespread disaffection with the previous Executive’s papers showed that. Confident that he’s not leaving his moderatorial successors “a cupboard full of skeletons” Norman also suggested that the definition of the role of moderator deserved thought. Around many issues, including the gender of moderators – of which he says “I would love to see a woman who was moderator, but I suspect that’s a wee while away” – what makes PCI so conservative and slow to change? Norman described a charity concert run by the Carrickfergus Presbytery in the Ulster Hall as an “extraordinarily uplifting” highlight from his year as moderator. There were difficult moments in the year too. “There were many. How many do you want? I think probably the most difficult one was being in Malawi during the visit of the Pope and the furore that broke around me when actually I was unable to even hear what was being said and to respond to it. That’s not a complaint, just a statement of fact. That was really quite difficult. When I talked to Dr Ivan Patterson, he was less than 72 hours away from taking over the reins at the front of PCI. I asked what in his life or ministry had prepared him for this moment? He’s been ministering in the Newcastle congregation for twenty years. The church has recently completed a redevelopment and he welcomes the opportunity for children from the town – who attend different schools in surrounding towns – to be able to mix together twice a week, breaking down church and community barriers. What are the big issues that face Newcastle today as a town, a society, a community? He’s proud of the good relationships between townspeople and churches in Newcastle. “From I went to Newcastle, I was keen that there would be good relationships between everybody. So I’ve gone out of my way to keep good relationships. I think Newcastle was a town that throughout the Troubles was very fortunate. There are no ghetto areas, so the whole town is mixed and relationships have always been – at least superficially – good if not slightly deeper than that. Later in the interview, Ivan refers back to another example of “reaching across the community” and his involvement in the setting up of Youth Link NI, an inter-church youth service established by the Catholic Church, the Church of Ireland, the Methodist and Presbyterian Churches in 1991. As Norman Hamilton pointed out, society is increasingly secular. I asked what Ivan thought about the church’s changing role in society? “Certainly I think we are fairly largely “post-Christian”, in the sense that even some of the Christians are almost post-Christian because for many people it is really something they do rather than something they know about and something that they want to experience of God. This year the theme that I’ve got is “Word is Life” so it’s really discovering God through his Word, and trying to expose people to what Christ was saying to us and what he expects of us in the world. To me one of the big challenges is to try and get folk to think – especially Christian folk to think – what God might think and not necessarily to be preaching to people but to be just among people. So given Ivan Patterson’s theme for the year, does he think it’s important for churches to spend more time worrying and agonising over ordaining gay ministers and resolving Kirk Session disputes than tackling things like poverty which is what Jesus talks about most in the Gospels and seemed to be pushing his buttons? “I do think there are times when we get hung up on important issues but sometimes … If I can explain it this way. I remember Orlando Costas being here years ago and he talked about the truth being like a flash lamp. And what so many Christian people do is they shine the flash lamp up into the air and look at the beam, and they forget they ought to turn it down onto the road and say what does this mean for me living out my Christian life. For the first time, representatives of various sporting organisations have been invited to the opening night of the General Assembly, including the GAA, IFA and Irish Rugby Football Union. Ivan welcomes the greater inclusion of civil society. Given that approach, does it sit oddly with him that somebody like Cardinal Brady – who he’ll meet regularly during the year – would not be invited to the opening of the General Assembly? Described as “conservatively biblical with a strong evangelical outlook”, Ivan Patterson explains what those labels mean to him. He’s looking forward to the year ahead, with its programme of church visits and services, as well as invitations to civic events. What’s he dreading? Having been away for the last three weeks preparing for his year as moderator, he knows that he’ll miss his home congregation in Newcastle. The opening night of the General Assembly takes place on Monday night at 7pm in Church House, Fisherwick Place, Belfast. Tickets aren’t required and anyone is welcome to attend. (Belfast Lord Mayor Niall Ó Donnghaile is taking up his invitation and will be joined for the first time by representatives from sporting organisations including the GAA, IFA and Irish Rugby Football Union. Radio Ulster normally broadcasts the opening night on Medium Wave with a wry commentary from Bert Tosh and William Crawley, and there’s always a chance that PCI may stream it on their website. 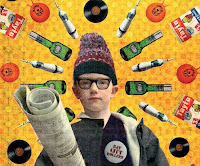 Belfast Book Festival has just launched its programme. Running between 13 and 19 June and based in and around the Crescent Arts Centre, the festival is “intent on capturing the literary energy of the city in a week-long celebration of the writer and the reader”. There are a whole series of events for young bookworms with free storytelling in the Storybook Cafe on Saturday 18 and Sunday 19, a one hour Nearly True Tales Tour around the Cathedral Quarter meeting characters from children’s books (£5/£3) and a reading by Nicola Pierce from her new book Spirit of the Titanic in the Ulster Folk and Transport Museum at 2pm on Tuesday 14 (£6/£4) which is also hosting the major Titanica exhibitions at present. And if all that’s not enough to tickle your literary taste buds, there’s a Pecha Kucha Night in aid of reconstruction following the Japanese earthquake, the Wireless Mystery Theatre are putting on a live performance of The Return Room, and there’s a Book Festival Quiz night. The School of Art and Design’s End of Year Show takes over the Belfast Campus of the University of Ulster at the beginning of June each year with student work festooned across every available space in the two main buildings. A great chance to buy works from as-yet unknown - and not too expensive - artists! The end of year show now forms part of the large university-organised Ulster Festival Of Art and Design which packs in exhibitions, talks, master classes and live music. A free photography exhibition is runs from Saturday 4 to Saturday 11 June in the York Street building. Involving both work from staff and students, Creative Capital captures imagery of arts buildings that have recently opened or are due to open soon. Games designer and theme park architect Phil Campbell is speaking at 7pm on Tuesday 7 June. User Experience Designer Cennydd Bowles is speaking at 7pm on Friday 10 June about “the world of user experience design and its growing significance to web design”. A ticket for either event will set you back £6 (£3 concession). Gráinne Duffy will be singing the blues alongside Ronnie Greer’s augmented band on Friday 10 June at 8pm. £10. And if that’s not enough, there’s a three-day Experimental Film Symposium and a spot of puppetry.